Jem Johnson tackles Dungeons on his backhand. Zigzag: So we’ve seen you bouncing around the world’s big wave locales, and then of course there was that breakthrough XXL Irish session. But, who the hell is Jeremy Johnson exactly? Jeremy Johnson: Haha, I was asked that a lot now overseas since that session! Well, I grew up in Llandudno in Cape Town, my grandparents had the first house there near the beach as well as a spot right on the beach which my grandfather and John Whitmore used on the weekends, and my grandfather later donated it to the lifesavers. I have always lived on or near the sea, sailing, diving, fishing and surfing. My father was one of the first surfers in Cape Town and was in the first Endless Summer film, so I guess it’s in my blood. How did you get into the whole big wave thing? I used to work with Grant Spooner from Marine Scene, he was in charge of all the water safety for the Red Bull Big Wave Africa. After watching the guys surfing those waves I knew it was something I wanted to do and be a part of. All the guys have been very helpful and have influenced me in different ways but I will have to say that Andy Marr and Twiggy have had the biggest influence on me, as well as Mickey Duffus and Simon Lowe. Those guys are nearly twice my age and charge harder and are more committed than any one I know! It’s amazing. True that. Seems like you also have a penchant for getting your arse kicked though, cos every now and then we see some silly photo of you dropping in beyond vertical at Dungeons or doing yourself in somehow. What’s up with that? 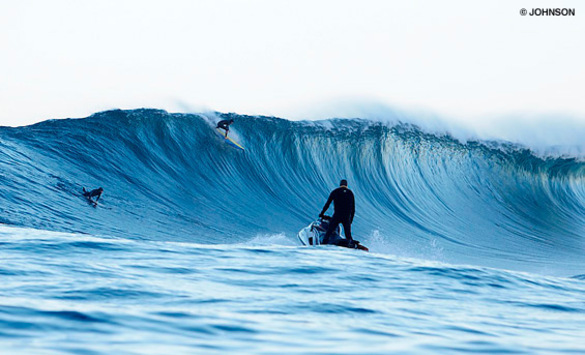 Jem on his yellow gun drops into the bowl at Mavericks alongside Pat Gadauskas. Eina bru. You’re also related to Zag photographer Richard ‘Stix’ Johnson, right? And we know Stix didn’t exactly get his name for his buff legs, so how do you avoid getting snapped in half surfing the waves you do? Fair enough. We see you’re also a Billabong XXL nominee for that rather large wave you caught at Prowlers. Think you’re in there with a chance? That wave is up for Biggest Wave and Ride of the Year. The biggest wave is hard because Jaws has also been really big and the ride of the year should go to David Scard for his wave at Cloudbreak, but I’m still super amped to see what happens. Endless surf trips, eating sushi off midget models, a racing car… What would you do if you did win the money? Have you tried bribing any of the judges? $50 000 dollars is a lot of money but I’m sure that I will think of something fun to do! Nah, no bribes – I was chilling with Twiggy on the beach the other day and he explained it all to me and it is pretty much legit and straight forward. Jeremy stops for a chat with Greg Long and Twiggy after another giant wave at Mavericks. You know that the Oakley One Wave Wonder is also looking for some mega rides? In fact, we reckon if you can backdoor Dungeons on your backhand and pull an air on the inside bowl, you’re in there. What do you say? I actually did that last year and the chances of doing it twice are low. so I will have to think of something else…heh. Going left at Sunset will eventually get you famous…or hurt! Ok, we’re definitely not the type to blow smoke up butts on the brah grill, but a lot of ous have commented on your smooth style in big waves: It’s difficult not to look like a stinkbug in survival mode, but you somehow pull it off. Any tips for aspiring big-wave stylemasters? Good call. What’s on the horizon for Jeremy Johnson in the year ahead? I have just been on holiday in Mozambique with my girl Caitlin and some friends for 10 days, which was awesome after a cold three months in Europe. This year I should have a jet ski which will make life easier and I guess do the same – surf as much as possible, be on all the big swells and then get ready for the Northern Hemisphere in November again. Any parting shots for all the brahs out there? Standing on the edge of a mountain is much like staring down the face of a massive wave when you are about to jump to your feet. Jem Johnson in his element above Cape Town.